The Grand Army of the Republic was founded in Decatur, Illinois on 6 April 1866 by Benjamin F. Stephenson. Membership was limited to honorably discharged veterans of the Union Army, Navy, Marine Corps, or the Revenue Cutter Service who had served between 12 April 1861 and 9 April 1865. 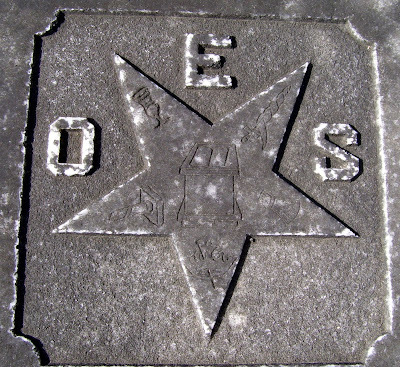 Next on Nettie's gravestone is the emblem for the Order of the Eastern Star. I was not very familiar with this emblem or organization, and researching it proved to be most interesting. According to Wikipedia.org, "The Order of the Eastern Star is the largest fraternal organization in the world that both men and women can join. It was established in 1850 by Rob Morris, a lawyer and educator from Boston, Massachusetts, who had been an official with the Freemasons. It is based on teachings from the Bible, but is open to people of all monotheistic faiths... Members of the Order are aged 18 and older; men must be Master Masons and women must have specific relationships with Masons. Originally, a woman would have to be the daughter, widow, wife, sister, or mother of a master Mason, but the Order now allows other relatives..." Famous members include Clara Barton, Caroline Ingalls, Eleanor Roosevelt, Laura Ingalls Wilder, and Maya Angelou. The emblem of the Order is a five-pointed star, and the character-building lessons taught are stories inspired by Biblical figures. In the center of the star is a pulpit. One point contains the image of "Electa's Cup" from the story of the "elect lady" in II John. Next is the "Adah Sword" from the story of Adah, Jephthah's daughter, from Judges. Next is "Life-Time Wheat" from the story of Ruth, the widow. Then there is a "Crown and Sceptor United" from the story of Esther, the wife. Finally is the "Broken Column" from the story of Martha, sister of Lazarus, from the Gospel of John. 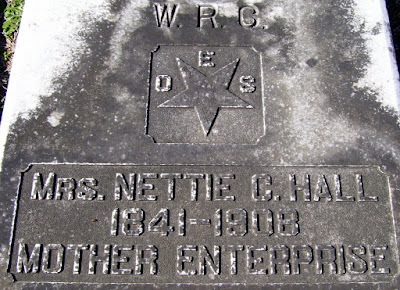 And finally, the last line from Nettie's gravestone -- "Mother Enterprise." This is a personal title. According to the Evergreen Cemetery Tour Map and Guide, Nettie was among the first colonists to arrive in Fitzgerald, GA (known as "the colony," or "shacktown") in 1895. She was a reporter for the Enterprise newspaper beginning with its first edition on 12 December 1895. Later, she bought the paper. Nettie was also a famed speaker and temperance movement worker in South Dakota, and she had a passionate interest in the development of the railroads. She was "cast in the mold of the nationally famous Nelly Bly." Nettie C. Hall was the widow of two Union veterans -- first husband Mr. Weems, second husband Cleveland T. Hall. Great post, as always. I see the WRC and OES a lot here in Kansas. Thanks, Gale! I've seen the OES several times, but just now decided to really figure out what it stood for. Thank you for your accurate description of the Order of the Eastern Star. I have been a member since Feb 1994, and love it dearly. OES is a integral part of my life, and I am blessed to be part of such a wonderful organization. If you are a mason, or a woman with Masonic relationship, I encourage you to join OES. Thank you for your accurate description of the Order of the Eastern Star. I have been a member for almost 20 years, and it is a major part of my life. I love OES and the many friends I have made in it, who have become my second family. I strongly encourage anyone who is able, to join OES.